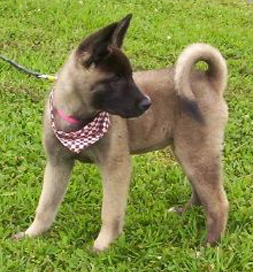 The beautiful Akita pup deserved a second chance. So thought the people at the Shamrock Pet Foundation in Louisville, KY. They rescued her from a facility where she’d been surrendered to be put down because she has a condition that causes one eye to be smaller than the other and also suffers from a malformation of her hind legs. Dreamer, as she is now named, was considered “special needs” because of her two conditions. When Dreamer was a pup, Judy had no idea what a comfort she would become. Judy Sapp of Valley Station, KY, hadn’t had a dog since she was a child, but lived in a place where no pets were allowed. Circumstances in her life changed, and she moved into a house. “I had always said once I had a home I would get a dog.” The time had come. “I applied [to adopt Dreamer] because I felt this was a dog that needed a lot of love that I had to give,” Judy says. That was in 2005. In 2008, Judy became aware of just how much the love was mutual. She was diagnosed with breast cancer. “I had a mastectomy in January 2009 and did six months of chemo, 18 months of Herceptin and five rounds of radiation. When I would come home from treatments, Dreamer would get in bed and scoot close to me.” Through those long hours and days, the dog comforted her. In 2012, Judy was re-diagnosed with stage 4 cancer that had spread everywhere except her lungs. The prognosis at her original diagnosis was two weeks to a year life expectancy. She attributes beating the cancer so far to Dreamer’s love and companionship. “When God sent Dreamer to me,” she says. “I think he knew I would need someone to look after me.” For Judy and Dreamer, the rescue was reciprocal.